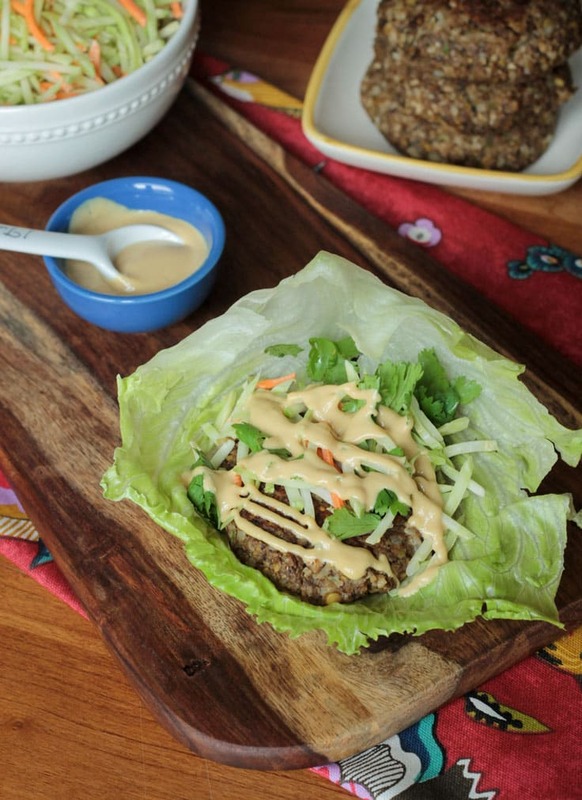 Lentil Burger Lettuce Wraps – an Asian flavored twist on a veggie burger. Oil-free and gluten-free options available. These burgers are crisp and firm on the outside, soft and moist on the inside and hold up really well. 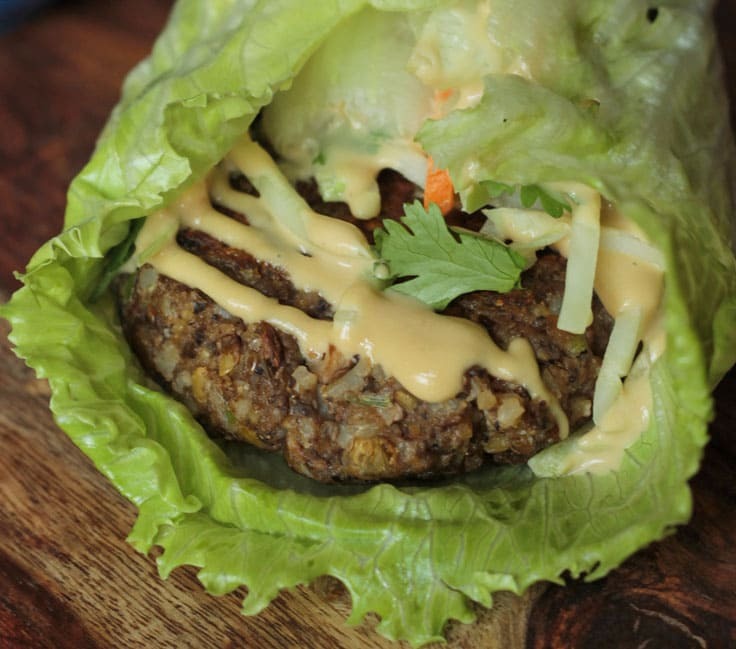 There’s a new favorite burger in our house and it’s this Asian Lentil Burger. I was staring in the fridge at leftover lentils and leftover brown rice and, voila, this burger was born. But, I was out of buns the day I served them, so they became Asian Lentil Burger Lettuce Wraps. And you can’t serve lettuce wraps without a dipping sauce, so then I created this amazing Creamy Sesame Soy Asian Dressing that I posted for you the other day. And instead of using it as a dipping sauce, I just drizzled it all over the top of these lentils burgers. Ok, maybe I did also dip it into the sauce because it’s just that good! If you love Asian flavors and want to switch up the usual stirfry/noodle routine, this one is for you! Have you ever noticed that the only way most meat burgers are varied is by changing up the toppings? Now it’s a cheeseburger, now it’s a bacon burger, now it’s a mushroom burger….but the burger is always the same. Why is that? Putting the flavor IN the burger is where it’s at! That’s why veggie burgers rule. This baby is chock full of lentils, rice, mushrooms, green onions, garlic, soy sauce, sriracha and more! Wrap it all up in lettuce topped with some shredded veggies and dressing and now you are eating your salad, too….all in one bite. That’s smart eating and being efficient! And I would bet that you could fool the omnivores with the way this burger looks. It’s crisp and firm on the outside, soft and moist on the inside and holds up well. You could put this on a bun if you wanted to. I experimented with baking and pan frying these lentil burgers, and while I did prefer the later, they are delicious either way. They are more firm if you bake them, but more moist if you pan fry…just depends if you want them to be oil-free (baked) or not. I also give a gluten-free option in the recipe notes, so be sure to check that out if you wish. I topped mine with raw coleslaw veggies and fresh cilantro before drizzling on the Asian Dressing. The kids went crazy for these too and my son even took one in his lunch the following day. I hope guys love these Asian Lentil Burger Lettuce Wraps as much as we do. If you try them, please come back and leave me a comment below with your feedback. You can also find me on social media. Be sure to tag @veggie_inspired and #veggieinspired so I’m sure to see it. Enjoy! 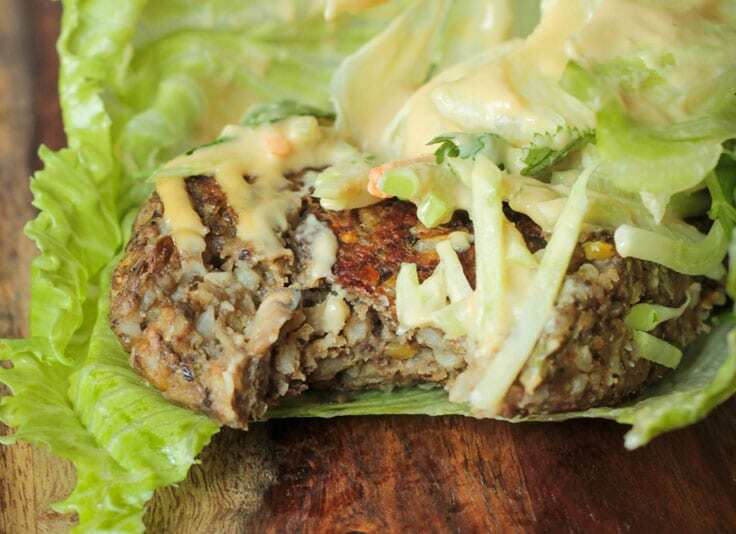 A Asian flavored twist on a veggie burger. Oil-free and gluten-free options available. These burgers are crisp and firm on the outside, soft and moist on the inside and hold up really well. In a small pan on the stove, sauté the mushrooms over medium heat until soft, about 7-8 minutes. To the bowl of a food processor, add the mushrooms along with the lentils, brown rice, green onions, garlic, aquafaba, soy sauce, and sriracha and pulse until well combined, but not pureed. Pour the mixture out into a medium bowl and add the vital wheat gluten (or 1/2 cup breadcrumbs). Massage the mixture with your clean hands for several minutes until the gluten starts to work (it will start to get "stringy". If you are using breadcrumbs instead of vital wheat gluten, just stir to combine. Add the breadcrumbs (or other 1/2 cup if you already used them in the previous step) and stir to combine. The mixture should form easily into patties. If it's too wet, add another 1-2 tbsp of breadcrumbs. If it's too dry, add another splash of soy sauce or even water. Form the mixture into 6-8 patties. You can cook them right away or place the patties in the fridge in a single layer for 30 minutes to firm up even more. Bake the patties in the oven for 25-30 minutes, flipping them over half way through. Alternately, you can pan fry in a tbsp of oil for about 5 minutes each side on medium heat. Lay your lettuce leaves flat, top each one with a burger, raw shredded veggies, if using, fresh cilantro, if using, and a drizzle of the Asian Dressing. Wrap them up and enjoy! ~Nutrition facts calculated for burgers alone, not including any toppings. 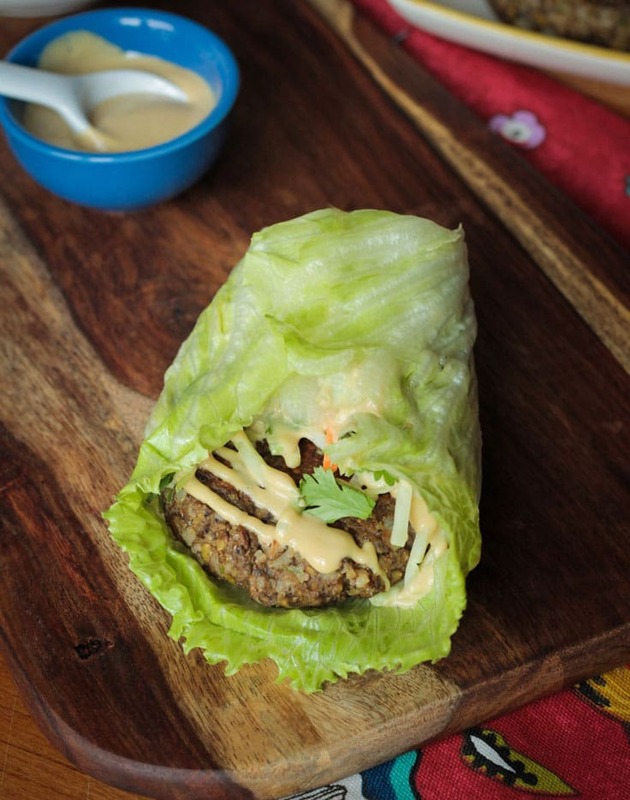 I love the idea of combining a veggie burger with asian-style lettuce wraps! So creative! Thanks, Dianne! They lettuce wrap definitely complements the burger perfectly! That’s such a great point about putting the flavor IN the burger instead of around it. And I like that you used lentils for the burger. They have so much deep deliciousness built into them. If I was stranded on a desert island and could only take one thing…it would be lentils. I can’t get enough of them! Thanks, Cadry! These look so amazing! The texture and flavors all look perfect! I totally agree with what you said too, I don’t want a plain burger patty, I want the flavor IN the burger too! Then toppings and more flavor! I hate plain tasting food. I need to try these, I just love everything about them! Thanks, Brandi! 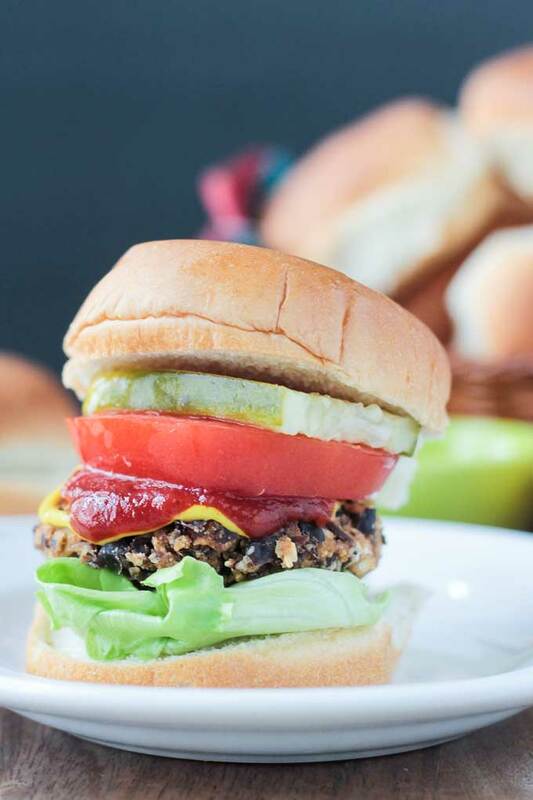 I’ve got plans to try your Red Beans & Rice Burger too…it sounds so delicious! Flavor IN the burgers are where it’s at! Ooh I love this! The lettuce instead of a bun is genius. Thanks, Becky!! I honestly don’t think these would be quite as good on a bun. It really takes all the different components to make the delicious flavors all stand out! How cute are these lettuce wraps and how have I never thought of this!! Brilliant! Thanks, Richa! The lettuce wrap idea kind of happened on a whim, but it worked out so well!! Isn’t it fun when you can make something out of leftovers! You may have been out of buns, but I love to substitute collard greens for wraps and lettuce leaves for sandwiches. These flavors sound wonderful! I love to use sriracha in my cooking. Your dressing sounds yummy as well! I LOVE collard wraps! Thanks so much, Willow! Sriarcha makes everything better, right?! Love the Asian touch and wrapped in the lettuce keeps it light and healthy. Thanks, Mark! Yup, go ahead and have two! 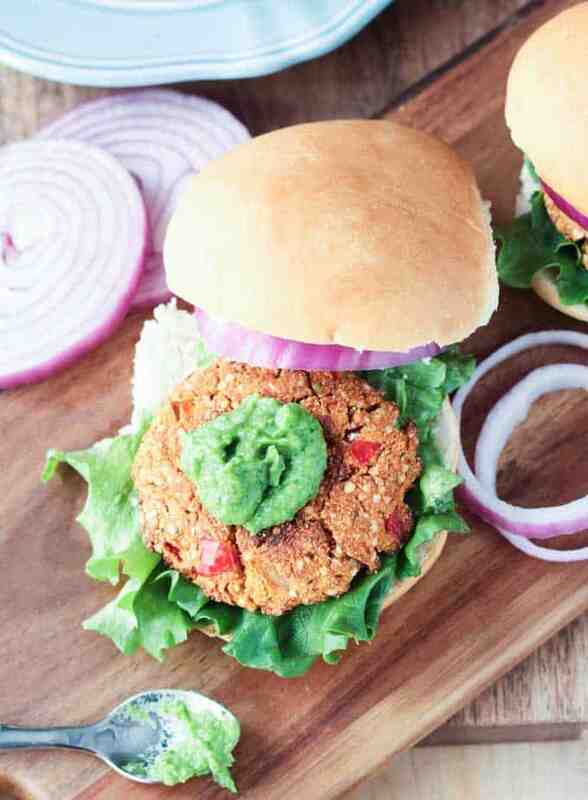 As much as I love a good beef burger, veggie burgers are always a great option when you want something lighter. These sound wonderful, especially that sauce!! Thanks so much, Kathryn! I’ve used the sauce on many other things since…it’s so good! These look so tasty! A perfectly delicious lunch idea! Thanks, Paige! Let me know if you try them! Thank you so much, Sina! The lettuce wrap went perfectly with the flavors of the burger! LOVE LOVE LOVE this! And I see a hint of aquafaba inside the recipe? Amazing!! 🙂 Always a pleasure to see your new recipes Jennifer! Thanks, Levan!! Aquafaba is my new favorite egg replacer. I’ve been using it in everything. Still need to try out your AMAZING macaroons though! Aqua faba is also brilliant to dunk tofu in after dowsing with flour and before crumbing. I made the mistake of not wiping the bottom of the glass jar I poured the aqua faba into before I put it in the fridge. It’s excellent as glue! Monica, that is a brilliant tip!! Sometimes mistakes are actually happy accidents! LOL, Hauke!! My son detests mushrooms too, but he happily gobbled these up. He had no clue they were in there. You don’t taste them, but they do give a nice depth of flavor. You should try it!!! Lettuce wraps are the best! Don’t you love taking random leftovers and turning them into something awesome? Great recipe, Jenn! You should have seen our dinner tonight, Linda! Talk about random leftovers…but it turned into some delicious enchiladas!! Leftovers rule! Oh, man! These sound absolutely fantastic. Love the flavors and then eating them as a lettuce wrap sounds even better. I’m going to pin this so that I remember to make it later. Looks so delicious!!!! This burger lettuce wrap resonates well with me. I just love everything about this recipe and I can’t wait to try it! Thank you so much, Michelle! Please let me know if you do! Me too, Vanessa! I LOVE lentils! Don’t know what I would do without them! I hope you love it! Love these…the sesame based sauce really brings it together…and the lentil brown rice combo is really robust. Awesome! Thanks, Pragati!! The sauce really does make the meal!! That is hysterical Jenn! Surely there must be edible tape available. I mean there ARE edible underpants!! I seriously want to take a big bite of this 🙂 I love eating my burgers in lettuce wraps as well! Love that sauce on top! Thanks, Ceara! The sauce makes the meal, right? 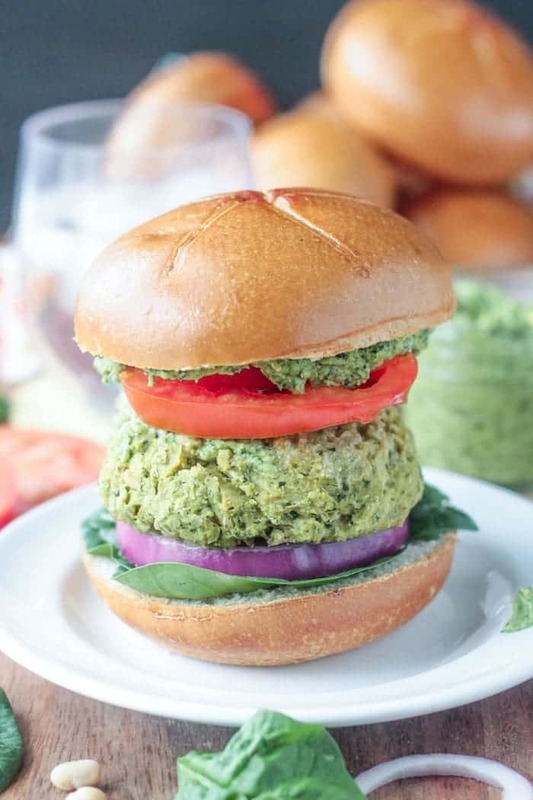 I love a good veggie burger and this sounds delicious! Lettuce wraps are such a good twist too. I love this when I don’t feel like too much bread. YUM! Thanks, Sophia! I’m actually glad I was out of buns because lettuce wraps really do go best with these! I bet! It’s almost like those asian chicken lettuce wraps but a vegan burger! Yes! Double the flavor…always a winner! 🙂 Thanks, Natalie! Woowee! These look like meat burgers! (Scared me for a second) 😉 Haha! Soo good though! Asian flavors are some of the best…sesame love for life! LOL, Rebecca! Don’t worry, you won’t be finding any meat here, I promise! I am huge sesame lover too!! It’s so good! Have a great weekend! This looks absolutely wonderful but I have a memory like a sieve so I need to print the recipe. Is there a print button that I’m missing? And yes, yes, I’m all for keeping it green but being vegan I’m way ahead of the meat eaters in saving the planet. Hi, Monica! There is a print button right below the picture in the recipe box. I need to find a way to make that bigger!! Have a great weekend! AHA!!! Found it. Brilliant. Thanks a bunch Jenn.